After the nuclear war in the year 2XXX ---, having survived by escaping into a nuclear shelter, we are now starting to reconstruct earth. However we have came upon a terrible monster, an Artificial intelligence computer whose code name is DALUAS. DALUAS has transformed part of the planet surface into a mechanized city, and the ultimate goal is to seize control of the entire planet. DALUAS must be stopped, at its up to you and the most advanced fighting machine ever created to do it! You control the CA-214, a transforming vehicle capable of many different modes of fire. Only you can stop DALUAS. OK, we may have heard the story a dozen other times before, but the game does not need a huge story, its a shoot 'em' up, enough said. The gameplay is pretty simple, you fly though levels shooting alien spacecrafts, while trying to find a suitable weapon to destroy DALUAS. Eventually you do and you travel underground for the final confrontation with DALUAS. Pretty simple really, there isn't a great deal to the game. Since the game is on card format I guess this is as good as we can expect. Some of the weapons you can transform into are pretty cool, but you have to think at the same time they are pointless, because DALUAS can only be found by using the correct weapon. Anything else is just dragging the game on. I have no idea why the developers thought this was a good idea, but it just isn't fun flying though the same level after level desperately trying to get the "right gun at the right moment". Graphics are equally as simple as the game. There is nothing special about them, even the opening title screen is a big letdown. 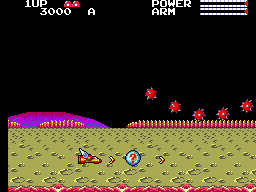 The one plus here is that the graphics are well animated, and the first few enemies you see on screen do seem to be of nice crisp quality. The background graphic keeps repeating itself, you get bored very quickly looking at the same things. There's no eye candy here. The Music was just as repetitive as the game, after a while you end up muting it and continuing without it. The sound is OK, there's a few explosion, and different firing sounds for each weapon. But again, it bores quickly. Controls were overall very good, the ship responded quickly and the fire buttons fired instantaneously. No complaints here. This game has next to no replay value, the game itself can be completed in under 5 minutes if you know what your doing. After you defeat DALUAS the first time you just have to begin again. 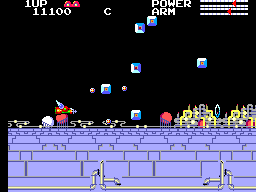 This time the ship moves slightly faster and enemies are in different locations. I highly doubt anyone will play this more than a few times after completion. Transbot is a fun-for-five minutes game, that should have been much longer. If there were only a a few more levels, some different backgrounds and a few different boss characters thrown in then all could be forgiven. 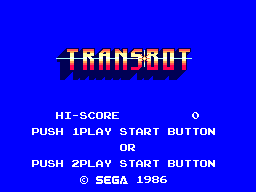 As it stands playing Transbot is just dull and ultimately pointless.